Management Strategies in Athletic Training, Fourth Edition, helps current and future athletic trainers deal creatively with the management challenges they will face on the job. Like the previous editions, the fourth edition uses a unique case-study approach in teaching students the theories of organization and administration and their applications to real-world situations in the profession of athletic training. The text, part of Human Kinetics’ Athletic Training Education Series, is an excellent resource for building comprehensive knowledge of management theory as well as the problem-solving skills to put it to practical use. 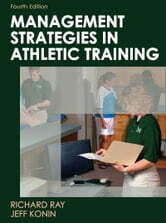 The book’s organization strategies can also be applied beyond athletic training to a variety of fields related to sports medicine, making it a valuable resource for any sports medicine professional. Designed to encourage critical thinking, the fourth edition of Management Strategies in Athletic Training opens and closes each chapter with realistic and fascinating case studies presenting real-world dilemmas faced by athletic trainers. A series of questions at the end of these scenarios challenge students to analyze and apply the principles in the chapters to solve the hypothetical situations and ultimately prepare them for the kinds of problems they will face from day to day as professionals. To support learning, the text includes tools such as chapter objectives, key terms, and review statements as well as sample administrative forms that readers can both study and adapt to their own work situations. Special elements and appendixes provide direction for deeper study by referring students to Internet resources, other Athletic Training**Education Series texts, sample forms for analysis of athletic training programs, and material on regulations and ethics in athletic training. In addition, the fourth edition covers new material that students will find helpful as they embark on their athletic training careers, such as compensation, tips for finding a job, and negotiating skills for accepting a job. For instructors, an ancillary package consisting of an instructor guide, test bank, and new image bank will aid in course development. Loaded with additional case studies, course projects, chapter worksheets, and a sample course syllabus, these materials can be used for organizing classes, testing students’ knowledge, and creating exciting learning experiences.